"The BYD 'Dual-Mode' vehicles resolve any 'range anxiety' that consumers might have driving an all-electric vehicle. The F3DM can be treated as an all-electric because gasoline is never required – users can drive all-electric all the time"
"We are ecstatic to partner with BYD to test this fantastic EV fleet technology – not only will these electric vehicles reduce fuel costs significantly, but it will reduce direct-emissions by almost 37 lbs of CO2 per car, traveling less than 40 miles per day!" said HACLA President and CEO, Rudolf C. Montiel. "With BYD's technology, I believe we will accomplish great things for the environment and demonstrate the lowest-cost fleet program in the United States." The F3DM (Dual Mode) sedans used in HACLA fleets can travel by electricity for 40 to 60 miles. An important attribute of the Dual-Mode vehicle is that the users have the ability to manually switch the vehicle to stay in all-electric vehicle or "EV mode" just like a conventional battery-electric vehicles (BEV) throughout the life of the car. However, if there is a requirement to go farther than 60 miles in a given day, the vehicle can be manually switched to plug-in-hybrid electric or "PHEV mode", where a 1.0L gasoline engine can be engaged to extend the range another 300+ miles while charging the batteries. "The BYD 'Dual-Mode' vehicles resolve any 'range anxiety' that consumers might have driving an all-electric vehicle. The F3DM can be treated as an all-electric because gasoline is never required – users can drive all-electric all the time," stated Micheal Austin, Vice President of BYD America. "As a leader in the affordable housing industry, HACLA continues to implement innovative technology to reduce cost as a sustainable solution to helping the environment," said Mayor Antonio Villaraigosa. "I commend HACLA and hope that its example will lead others to make environmentally conscious decisions." The F3DM comes with an onboard overnight-charger which charges vehicles in less than 7 hours, allowing HACLA to simply install standard 220VAC outlets as you would for a home clothes dryer in their EV fleet parking areas. "Part of the appeal of this EV is the fact that we don't need any special EV charging pedestals or equipment to charge, its all standard – that kept our initial launch costs in control and shortened our pay-back times," said Mr. Montiel. BYD is also in discussions with HACLA to integrate solar power to charge an Energy Storage Station (ESS) during the day that could then discharge later during the EV fleet charging hours. 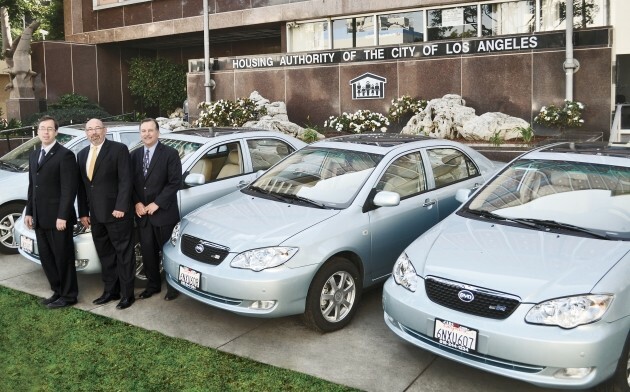 "BYD is pleased to partner with HACLA and Rudolf Montiel to integrate EVs and potentially renewable energy to charge them – he is a visionary leader and a great friend to City of LA and to the environment," said Mr. Austin. "The HACLA is the second largest authority of its kind in the United States, serving more than 100,000 residents, and takes seriously its obligation of leadership both environmentally and fiscally" said Mr. Montiel. 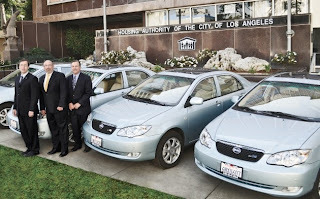 "This test partnership demonstrates our strong commitment to reducing the City's carbon footprint and HACLA's cost."